Fire Roasted Jalapeño Cheese Ball Recipe - Mild or Super Spicy! 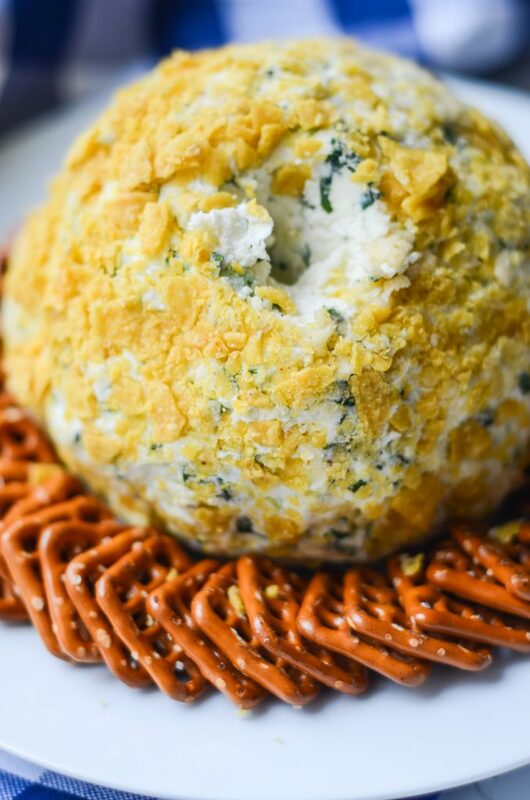 This jalapeño Cheese Ball recipe is a perfect appetizer for any occasion. It is made with extra sharp cheddar cheese and has a subtle spiciness from the fire roasted jalapeños. Note: This post was updated with new content on January 3, 2019. Cheese balls are extremely easy to make ahead. 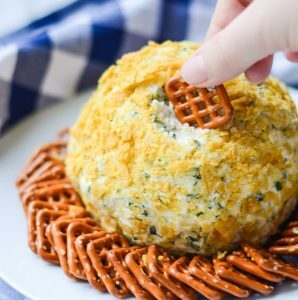 In fact, I recommend it with this cheese ball recipe because it gives the flavors time to marry. You can prevent the tortilla chips from getting soggy by waiting to coat it until right before serving. Once you’re ready to serve it, pull it out of the fridge and uncover it. Let it sit for 20 minutes at room temperature and then roll it in the tortilla chips. If you just want to avoid the tortilla chips all together, you can roll it in chopped green onions instead. These tips will help to improve on the classic cheese ball recipe. How To Buy and Store Fresh Herbs. Make sure that the cilantro stays fresh and know what to look for at the store for the best possible herbs. Broiling 101. If you don’t have a gas cooktop, you’ll use your broiler to roast your jalapeños. While not your typical holiday appetizer, this jalapeño cheese ball brings a nice alternative flavor to the table. For a slightly sweeter cheese ball, add ½ cup of crushed pineapple. This jalapeño cheese ball recipe will stay good in the fridge for 3-5 days. The longer the jalapeño cheese ball is in the fridge, the soggier the tortilla chip coating gets. Make sure to wrap it in multiple layers of plastic wrap to ensure freshness. Of course, more tortilla chips won’t hurt either. Use the tricolored ones for an extra beautiful presentation. The dairy in this cheese ball really tempers the spiciness of the jalapeños. Additionally, fire roasting cuts down the heat as well. If you would like this jalapeño cheese ball recipe to be spicier, simply add a few more jalapeños. With the five that the recipe calls for, I would classify the heat for this as a light-medium. If you don’t have a gas cooktop to fire roast the jalapeños, you can achieve the same results using the broiler. Place a rack in the upper third of your oven and turn on the broiler. Put the jalapeños on an aluminum foil lined sheet pan and broil for ten minutes (or until blackened). Flip and repeat until most of the pepper is black. 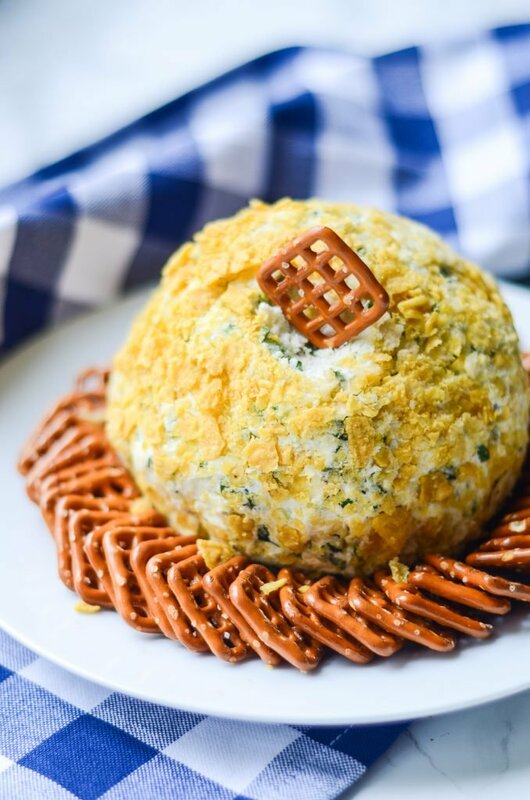 Want a free printable grocery list for this jalapeño cheese ball recipe? Get it HERE. With delicious extra sharp white cheddar and a smoky flavor from the jalapeños, this fire roasted jalapeño cheese ball is a perfect appetizer for game day. Serve it with pretzels, crackers, chips, or fresh veggies for a sure-fire hit! Turn the burner of a gas cooktop on high. Place the jalapeños over the flame and roast until blackened, turning as needed to cover all sides. Transfer the jalapeños to a bowl and cover with plastic wrap. Repeat until each jalapeño is roasted. Once the jalapeños have cooled, run them under cold running water and rub away the blackened skin. Blot them dry and mince them into small pieces. You can remove the seeds and veins if you want, but it’s not necessary. Set them aside. In the bowl of a electric mixer, use the paddle attachment to lightly whip the cream cheese. Add in the white cheddar cheese, jalapeños, and cilantro. Stir until combined. Season with salt and pepper and roll the mixture into a ball. Let it chill for 15 minutes, coat it in the crushed tortilla chips and serve. A cheese ball is my weakness – I have been known to over eat. Love that you used roasted jelapeno!! This would be a perfect game day snack. I’m totally a cheese ball overeater also! And with the slightly spicy kick of this one, I could easily eat the whole thing! Sharp white cheddar is my favorite! I can’t wait to try this at my next party!!! I love that you can make it ahead of time. I could eat ALL the sharp white cheddar! I hope you and your guests love this recipe! I love love jalapeños and cheese! This is a great appetizer option, especially for the Super Bowl this weekend. The pretzels for the dipping are such a creative idea. Thank you, Lauren. I feel like the pretzels provide a nice change up from the traditional cheese ball options. This looks delicious! My Aunt is all about bringing cheese balls to social gatherings, forwarding to her. I hope she loves it, Jennifer! It’s such a nice alternative to the typical cheese balls. This looks incredibly tasty! I can’t wait to try your recipe! I love jalapenos and cheese ball! They are such a fantastic combo! And I love the smoky flavor from the fire roasting! I love cheeseballs and this one sounds way better than average. Fire roasted jalapeno sounds amazing! It’s such a nice flavor to add to it. It’s like a jalapeno popper, but with a little added smokiness. Jalapeños with cheese are definitely a winning combo! I agree! You can’t go wrong with them! Wow I’ve never roasted jalapeños before! Now I really want to try this. Looks like a fantastic recipe to serve a crowd. Once you fire roast jalapenos, you’ll never go back! It’s such a delicious way to enjoy them! Such a nice idea! I love this and I’m sure it tastes amazing. And it looks great too. Will definitely make this for our next dinner party! I hope you love it, Amelie. It’s always a hit anywhere I take it! Jalapeno adds so much intense flavors to dishes this must be so delicious! I love how such a small ingredient can contribute so very much to a dish! Ohhhhh yes. This looks so delicious. Pinned to try this weekend. I hope you love it, Jenna! This looks delicious and perfect for game day! It’s perfect for game day. And not too spicy, so if someone accidentally tries it, they won’t start breathing fire. this looks like such a great appetizer! I love anything cheese so I would jump right in! Yaaasss!!! I’m totally on team cheese, as well. The more the better! I totally agree! Cheese balls are one of those things that I love to have, but rarely think to make myself. This is my new favorite, for sure. I love what the roasting does for the peppers! Great for game day! Yes! It adds such a nice smoky flavor and sweetens the jalapeños so nicely! What a fun recipe! I love a good cheese ball! This would be so perfect to serve on game day! I love it for game day. Plus, since the spice level is easily adjusted, it’s a cheese ball everyone can enjoy!